Beetroot holds great antioxidant properties and is full of essential vitamins and minerals such as vitamin C and nitrates. Do I know what that means? Not a clue, but I’m sure it’s really great. 1. Line a baking tray with baking paper (try not to forget like I did ha). 2. Measure out the base ingredients. 3. Place all base ingredients into a high speed blender/food processor, and pulse until mixture begins to stick together (will take a minute or two). You may need to lend a helping hand between pulses by stirring the mixture with a spoon to stop it from getting stuck. Additionally, if the mixture remains crumbly after a minute or two, you may need to add a tbs of water or coconut oil. 4. Once the mixture is of a thick sticky consistency, transfer to your lined baking tray and press down using the back of a spoon or a measuring cup to flatten until the base of the tray is covered. 5. Place in freezer to firm up. 1. Place all ingredients in a high speed blender/food processor until smoothish (you will still have some small cashew chunks present). This will take a minute or two. 2. Transfer this mixture to the lined baking tray on top of the base, smoothing over uneven surface using the back of a spoon. 3. Place in freezer to firm up. For the topping, you can choose whether you want to make the beetroot powder yourself or whether you would prefer a more straightforward approach by purchasing some. Beetroot powder can be purchased at most health food stores but isn’t super accessible at supermarkets as of yet. If choosing the latter, skip the following instructions and go straight to part 2 of creating the topping. 1. Rinse and cut your beetroot in half to create some stability. Lay the beetroot half on its flat side, and begin cutting very thin slices. Continue until all beets have been cut. 2. Place these slices on either an oven or dehydrator tray, ensuring none overlap if possible. FOR OVEN – 180 degrees Celsius or 356 Fahrenheit until visibly crispy and dry. FOR DEHYDRATOR – place setting on 50-55 degrees Celsius or 122-131 degrees Fahrenheit until visibly crispy. This took a couple of hours for me; although, it will vary depending on the dehydrator used and the thickness of slices. You may be able to combine some of the contents of trays as the dehydration process progresses as they will shrink a considerable amount. 4. Once desirable crispiness/dehydration has been reached, remove from oven or dehydrator, and allow to cool for 10-15 minutes. 5. 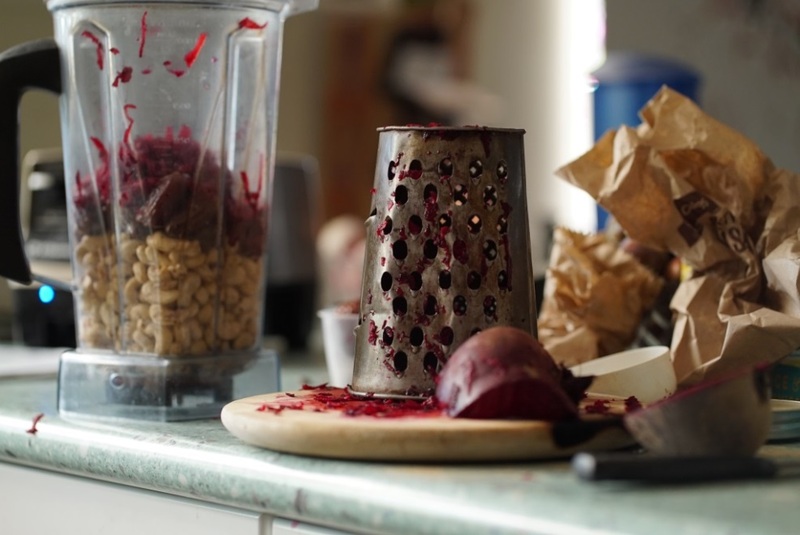 Using a food processor or mortar and pestle to blend/grind the dry beet slices into something that is as close to powder form as possible (there will still be some larger granular sized pieces). It may be helpful to add one handful at a time if using a mortar and pestle as shown below. 6. Once beets have been blended/ground as much as you deem possible, use a sieve to remove the larger pieces. Set these larger pieces aside in a small bowl. Below illustrates what your powder might look like after the larger pieces have been removed. 7. 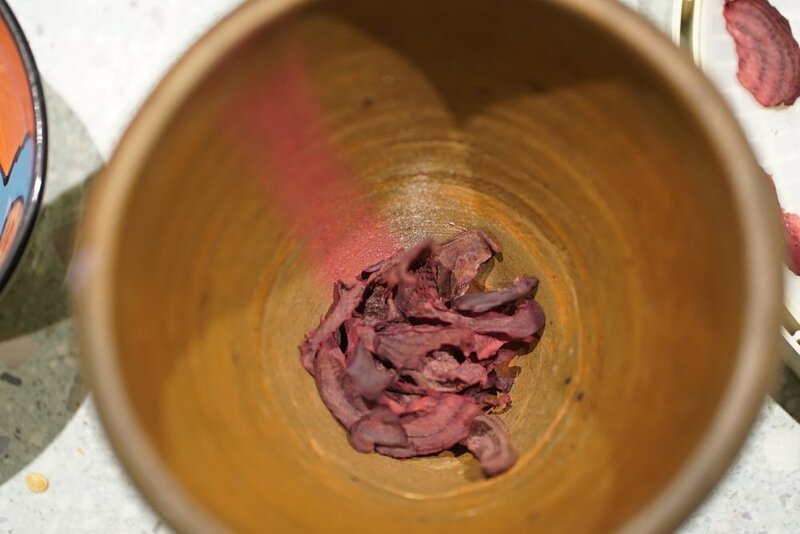 Set aside bowl of beetroot powder. 1. Half fill a large bowl or pot with boiling water. 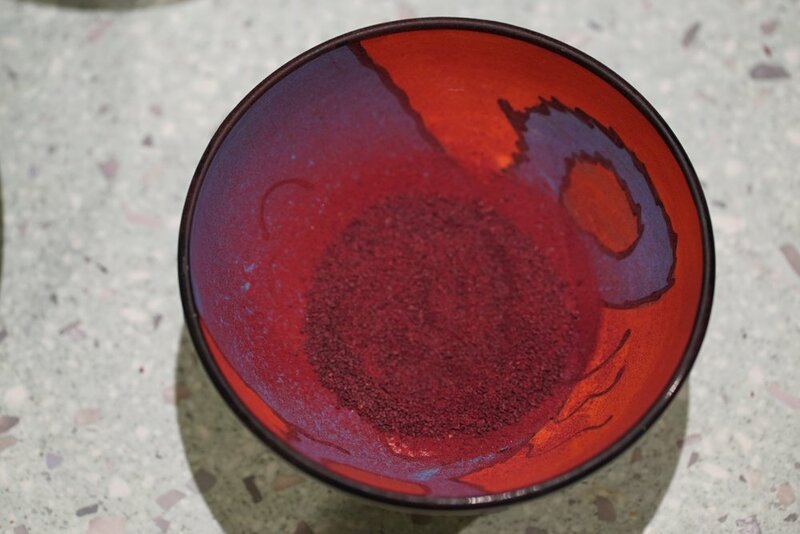 Place a slightly smaller bowl inside this one, and let it heat up. 2. 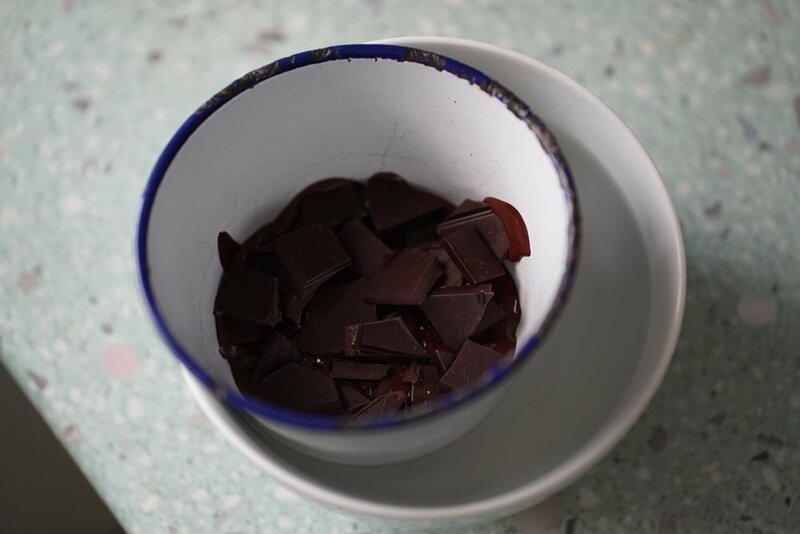 After 1-2 minutes, begin adding the 200gms of vegan dark chocolate. Use a spoon to stir the chocolate while it melts. 3. 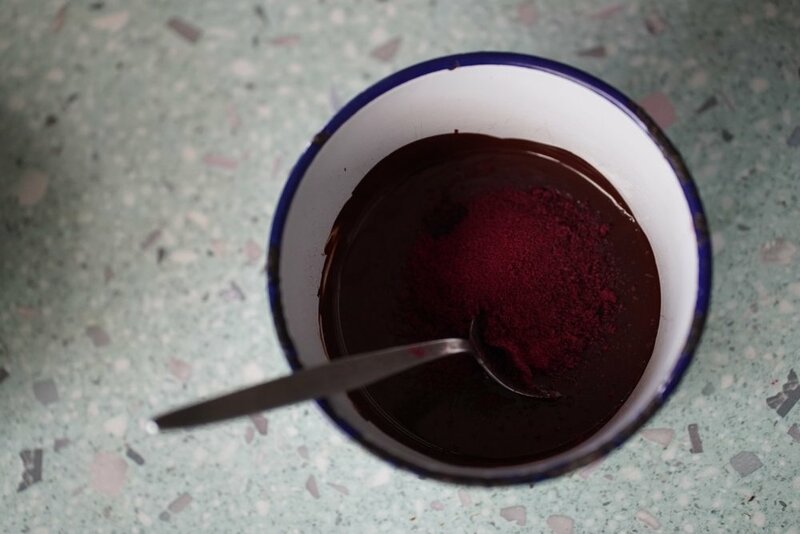 Once completely melted, add your bowl of beet powder to the chocolate. Stir to combine. This will add a natural sweetness to the bitter dark chocolate and tie in the with the beet theme of this cake. 4. 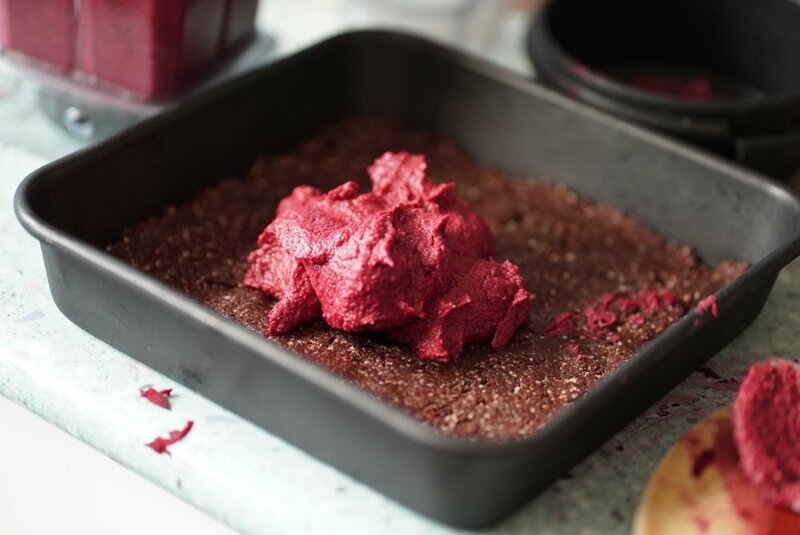 Remove your lined baking tray from the freezer, and add the melted beet-choc mix on top of already existing layers. You have to be quite quick to smooth out and spread the chocolate as it will harden on contact with the cold filling layer. 5. Sprinkle the larger beet root pieces set aside earlier on top of the beet-choc topping while still soft, as a visually pleasing garnish. 6. Cover the cake, preferably with a reusable vegan wax wrap, and secure with rubber bands as shown below. If you haven’t got any on hand, cover with a tea towel or a reusable plastic bag; cling wrap being an absolute last resort! 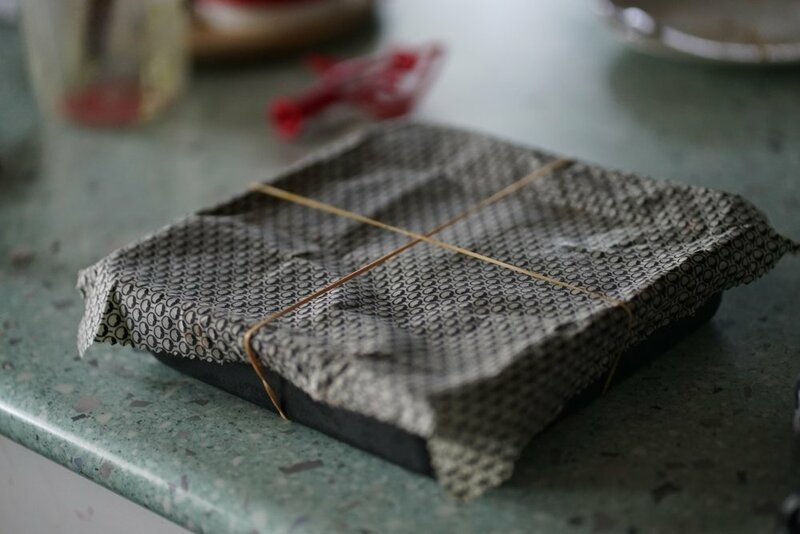 Vegan wax wraps are definitely worth investing in as a waste-free alternative to nasty cling wrap. If money’s an issue, there are plenty of DIY tutorials to explore online. 7. Place in freezer to firm up. 8. Woo, you’re done! I know, I know It was a long grueling process, but your taste buds will certainly thank me later. For those of us who are of the impatient kind, you will be happy to hear that once the chocolate has set (or even before if you’re that keen), the cake is safe and ready for human consumption. I like to slice this cake into small square/rectangular bite-sized pieces using a warm knife to cut through the chocolate topping without causing cracks in my master piece, but see what works for you. Now go away and feast on your semi-raw beetroot cake, and feel great in the body and mind because it’s that damn good for you! Look out for more weekly recipes from the other Ravens and I on the TRC website.